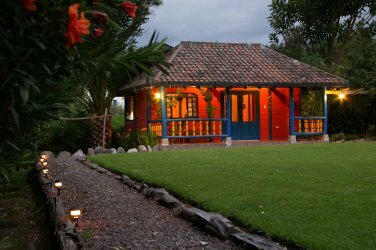 Bed and Breakfast Tumbaco is located in one of the valleys of Quito, near Quito's new international airport. The Tumbaco valley is known for its “everlasting spring” and for being warmer, greener and less contaminated than the capital city. It is a place preferred by those (temporarily) living in Ecuador. Modern shopping malls, good restaurants and pleasant outdoor Cafés are available in the Cumbaya / Tumbaco valley. This is the perfect place for those who love nature, as it has horse riding, hiking and biking trails. At the foot of the Ilaló magic mountain, the hacienda style main house features spacious gardens, a bio-orchard, swimming pool, sauna and jacuzzi, with private cottages painted in tropical colours. This unique site offers personalized service, peaceful country atmosphere and, definitely, a truly great breakfast. Last but not least, the house is located in a very safe neighbourhood. B&B Tumbaco is personally managed by its owners, both globetrotters. Gerrit is a Dutch anthropologist involved in international cooperation and Patricia is a lawyer, specialized in environmental management. We speak English, Spanish, German and Dutch.